DriveWorks 14 (and newer) and the Specification PowerPack contain functionality that will achieve similar results as this plugin gives. The Text File from Variables plugin will create a text file (.txt) from variables, prefixed with TD, created in a project. This plugin can either be used in DriveWorks Administrator (In which case it will run as part of the DriveWorks Addin inside SOLIDWORKS during model generation) or added in to DriveWorks Autopilot to run as part of the Autopilot function. 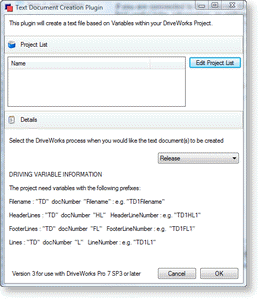 If you wish to use this plugin from the DriveWorks addin inside SOLIDWORKS, then you will need to ensure that the plugin version is matched to the exact version of DriveWorks that you are using. To make sure that the versions are matched, right click on the file DriveWorks.Engine.dll that comes with the plug in, and check its version number against the version that appears on the splash screen when you launch DriveWorks. Once downloaded double click the DriveWorksLabsTextFileFromVariablesSetup.msi file to begin the installation process. DriveWorks and SOLIDWORKS should be closed while installing the plugin. The plugin is uninstalled from Windows Programs and Features, and will be listed as DriveWorks Labs Text File plugin. DriveWorks should be closed and restarted once the plugin has been uninstalled to remove it from the plugin list in the DriveWorks settings. The plugin needs to know the name of each project it is to run on. This is the name of each project the plugin is to be run on, and is case sensitive. 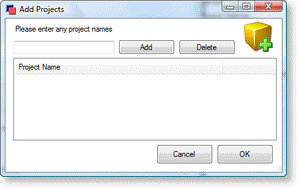 Click Add after each project name that is added. For the plugin to create the text file variables need to be applied into each project the plugin can be run on. The chart below lists the variables required in the project with example rules and meanings. "C:\DriveWorks Pro\Specifications\Text Files\"&DWSpecificationId&".txt" - Will create the file 5.txt in the C:\DriveWorks Pro\Specifications\Text Files\ (5 will change according to the DWSpecificationID), any folder that does not exist will be created by the plugin. TD1L3 IF(AdditionalNotesReturn="","Delete",AdditionalNotesReturn) - Will remove the line from the text document when no entries have been made in the form control AdditionalNotes, will place the text coming from the form control AdditionalNotes into the third line of the text document. TD1FL1 "This is the footer" - Will place the text This is the footer on the first line after all Line text has been inserted. TD2FL1 "This is the first footer line" - Will place the text This is the first footer line on the first line after all Line text has been inserted in the second text document. TD2FL2 "This is the second footer line" - Will place the text This is the second footer line on the second footer line in the second text document.